remembering the students`s massacre of 1968, Tlatelolco, Mexico. These photographic images are brief visual register of the commemorative political meeting in honor and memory of the mexican students killed (by the the institutional and no official forces of the mexican state), in La Plaza de la Tres Culturas, Tlatelolco (in the surroundings of Mexico City Downtown), the 2nd of October of 1968, during the repressive government of president D�az Ordaz, in the context of the student movement (with roots in several groups of students from diverse public universities) and during the previous weeks to the Olympic Games of M�xico 1968. 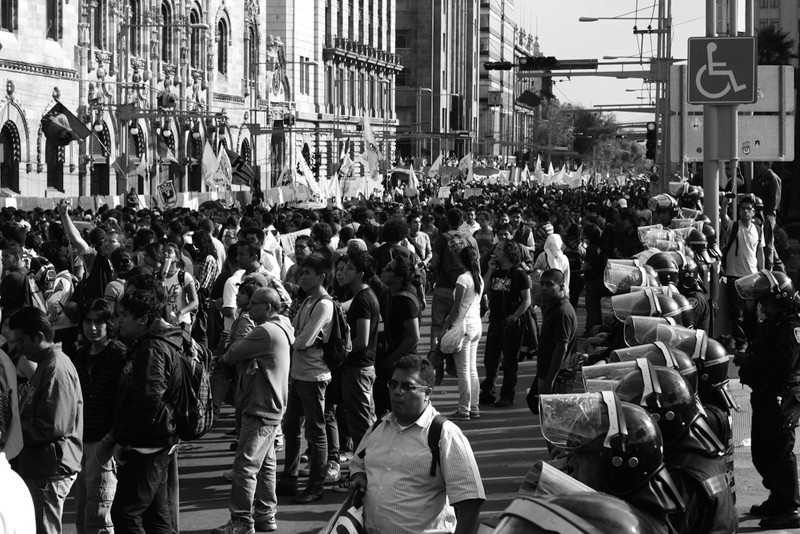 During the political meeting of October 2014 (in memory of the killed students of 1968), the Readers of student movement of 1968, with others movements and social organizations (such as Sindicato Mexicano de Electricistas, Frente de Pueblos en Defensa de la Tierra-Atenco, Movimiento �yo soy 132�, among other groups and citizens), claimed for the explanation of the violence and murders of 1968, the justice and the punishment to the members of D�az Ordaz government involved in the massacre. Keywords: the students`s massacre of 1968, Tlatelolco, Mexico.